Photo provided by ERM -- Peculiar knickknacks line the walls. Photo provided by ERM -- According to the game's back story, the room is filled with the belongings of an old New Orleans family displaced by construction. Photo provided by ERM -- A campy lighting feature made of flamingoes casts a glow in the room. Advocate staff photo by JOHN McCUSKER -- Andrew Preble and Michelle Calabro give instructions to participants before they enter Escape My Room. We were instructed to enter the 14-story federal office building at 701 Loyola Ave. and tell the security guard we were going to the fourth floor. It was a Saturday, and the building was virtually empty. Leaving the elevator, our instructions said to walk to the end of the long hall, where an old chair sits outside a door. For my three friends and me, it was time to play the game. It’s called Escape My Room, and it’s the brainchild of Andrew Preble and Michelle Calabro, two young entrepreneurs who opened their unique attraction to the public this week. In the parlor, there was a low-slung sofa dating to at least the late 1960s, the kind you might find in a grandmother’s once-stately home. Photos lined the walls. 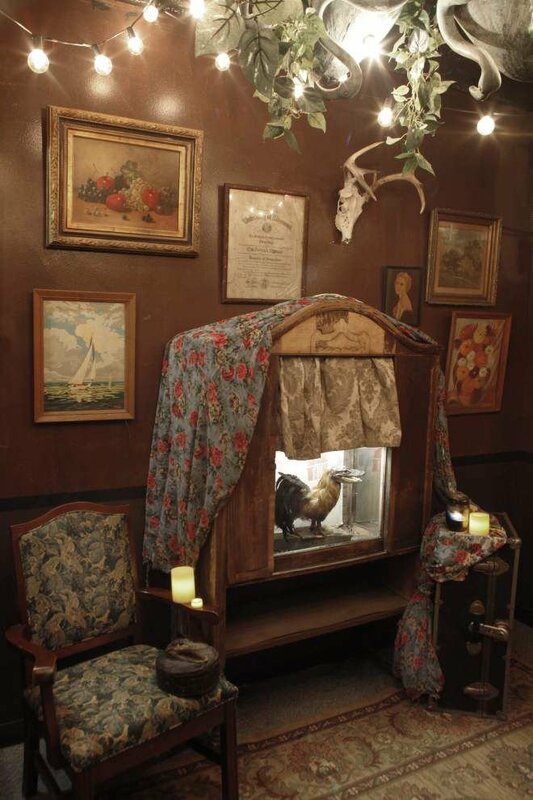 On one table was a glass case displaying a well-preserved rooster with the head of an alligator. Another case displayed a macabre diorama with moving parts, and two others held a long-dead baby gator and an iguana with a human head. On the ceiling was a chandelier made of campy plastic swans and flamingos. 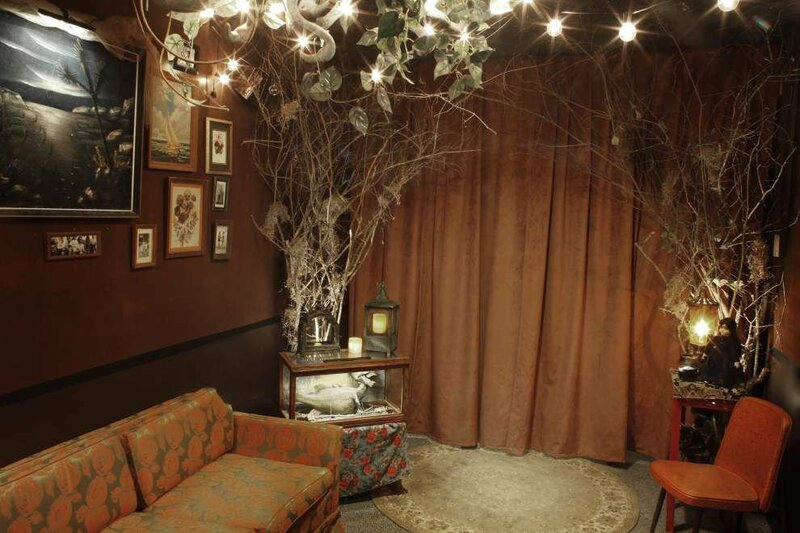 The couple gave us time to relax in the “parlor” before emerging from behind a curtain to explain our mission. We had read the backstory on EscapeMyRoom.com, so we knew a little bit about the DeLaporte lore. It seems the eccentric family’s mansion has been demolished to make way for the new medical complex downtown, and Mrs. DeLaporte’s life is in disarray. The family’s belongings, everything from Carnival memorabilia to furniture, photos, antiques and oddities, have been relocated to a suite in this building. After signing a waiver stating that we’d be locked in a room for one hour, we were led into the “study.” The door closed behind us and the game was on. Inside, we found pieces of Carnival masks and notes from Mrs. DeLaporte. We were so busy we’d forgotten that hidden cameras and microphones were recording our every move. For the next hour, every puzzle we solved revealed clues to the next one. We found keys and codes to open a door into a second room and numbers to open combination locks. Our group succeeded in escaping the room, but Preble and Calabro said less than half of participants in their test groups have escaped before time runs out. The story that Preble and Calabro came up with is fictional, but the Carnival history is real. The Mardi Gras study room will remain open for a year and then will change to another room in the DeLaporte house. The next room will feature a jazz theme and more of the DeLaporte story. Tickets are $28 and can be purchased on the website, EscapeMyRoom.com.